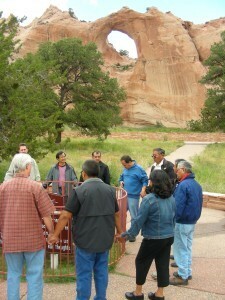 In the shadow of Window Rock, ethnic Grace Brethren pastors prayed for the Navajo Nation. Haitian, Hispanic, African American, Native Indian, and Chinese pastors in the Fellowship of Grace Brethren Churches celebrated three-fold communion this evening as they wrapped up three days together in New Mexico and Arizona. The pastors have been meeting since Tuesday afternoon, first in Albuquerque and for the last two days in Window Rock, Ariz. The week has included devotions led by Steve Galegor, Jr., who works with Albanian immigrants in Clifton, N.J.; Dumont Cardichon, a Haitian pastor who oversees church planting in the Haitian community; and Kevin Ong, director of the International House in San Francisco, Calif.
On Wednesday, Jay Bell, director of Internationals USA, shared about spiritual warfare and freedom in Christ. “When Jesus died on the cross, he completed two transactions,” he said, reading Colossians 2:8-15. “He covered our sins and He disarmed Satan and his angels.” He reminded the pastors of their place in Christ. “You may be here physically, but spiritually and judicially, you are seated with Jesus. This morning, the pastors brainstormed how to best work together to reach people for Christ. Jesus Munoz, pastor of Iglesia Comunal La Esperanza in Valrico, Fla., shared statistics about people groups in the US. Javier Forero, also on staff at Iglesia Comunal La Esperanza, challenged the men to reach beyond their own cultures to plant new churches. Liz Cutler Gates, executive director of the Brethren Missionary Herald Company, presented ideas of how they could communicate their vision to the greater FGBC. After lunch, they drove a short distance to the rock formation for which the community has been named. Nelson Betoney, father of Pastor Arnold Betoney, told about the Navajo Code Talkers of World War II, and talked about the history and traditions of the Navajo people. They also visited the Navajo Nation Capitol and Legislative Chambers. On Friday, the pastors head home with a commitment to keep in touch. See additional photos on the FGBC World Facebook page.